Last year’s World Cup tournament is what finally made me a full-fledged soccer fan. Team USA’s improbable draw with England, England’s subsequent collapse, Landon Donovan’s unbelievable goal… I got sucked into World Cup hysteria. Capitalizing on the event, EA Sports released a special FIFA edition specifically for the tournament. Craving some portable soccer action, I picked up the game for the PSP. 2010 FIFA World Cup South Africa provides 199 of the 204 national teams that entered qualification, and it offers several different modes of play. Beyond the standard “pick a team and play a single game” option, there are modes to play through the full World Cup tournament (including the various qualifiers), a “Captain Your Country” feature, and a “Story of Qualifying” option. Captain Your Country is intriguing, as it is basically a spin off of the “Be a Pro” modes that are all the rage in sports games these days. In this, you create a low-level player who is promptly placed on their national team. Your goal is to build up this player to greatness while leading his country to victory. My personal favorite is Story of Qualifying, which allows you to relive a lot of great moments inspired by the road to the World Cup. There are some truly memorable scenarios presented here, such as the Luxembourg/Switzerland encounter where Luxembourg shocked the world by winning 2-1. In this particular example, you play as Luxembourg in the 76th minute with the match tied 1-1. You get points for winning the match, conceding no more goals and/or by winning by two goals. There are dozens of scenarios like these from all over the world, and it’s a lot of fun trying to get maximum points in each one. 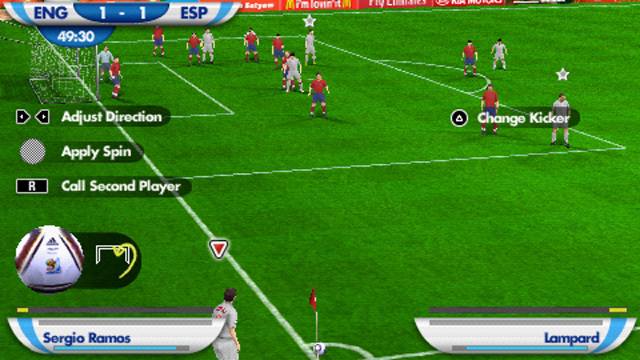 The core gameplay is easy to pick up and play, as the controls are standard for the FIFA series. Players move around effortlessly, and each team has their own unique style which comes across surprisingly well on the pitch. I did have some occasional problems with manually switching the players, and sometimes the AI determined I wanted to pass to a different player than I intended, but for the most part the on-the-field experience is more than satisfactory. 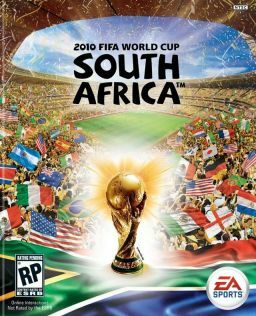 EA also succeeded in bringing the South African experience into video game form. The infamous vuvuzelas are ever-present (though they can be removed via the in-game options), and the soundtrack is a pretty diverse collection of music from all over the world. Clyde Tyldesley and Andy Townsend are competent on commentary, although they do tend to repeat themselves during the actual tournament. The country’s stadiums are brought to life, and a helpful map shows all of their locations. The graphics are typical PSP fare. It can be hard to see some of the players on the top half of the screen, but for the most part the game looks good enough. As far as portable soccer games go, I can’t really compare this to anything else. 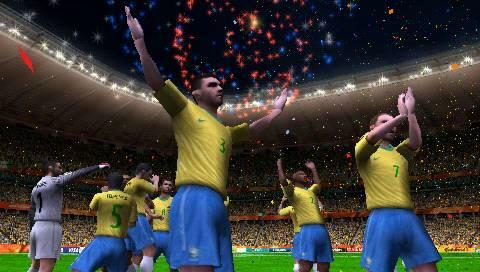 However, I have greatly enjoyed 2010 FIFA World Cup South Africa since it does an admirable job of maintaining the crazy atmosphere while also providing a surprising amount of depth in terms of gameplay. While there are occasional quibbles with the control, these are not major disturbances and they do not disrupt what is an otherwise fun experience. For those looking to relive last year’s memorable Cup, this is a great gaming option. Hey! I love your blog. It really gives me everything I needed!